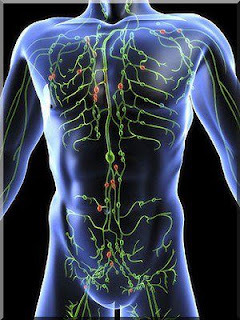 The lymphatic system is one of the most important systems in our body. Proper functioning of the lymphatic system is critical to our body's ability to detoxify, nourish and regenerate tissue, filter out metabolic waste and inorganic material, and maintain a healthy immune system. The lymphatic system runs parallel to the circulatory system. Unlike the circulatory system, in which the heart acts as a pump to circulate blood, the lymphatic system does not have a pump to circulate lymph. Instead, lymph vessels contain tiny muscles, or lymphangions (little hearts), which contract consecutive sections of the vessels to contribute to movement of lymph through the vessels via a peristaltic effect (peristaltic motion- waves of involuntary contraction passing along the walls of a hollow structure such as the oesophagus or intestine and moving the contents forward). Fatigue, stress, inactivity and/or trauma inhibit lymph flow. This compromises cellular functioning, metabolic waste ("toxins") accumulates, and we become vulnerable to the possible development of illness. Lymphatic drainage is a light, rhythmic, manual therapy employed to increase lymph circulation throughout the body. This subtle technique uses a repetitive pumping motion which, in part, moves the skin in the direction of lymph flow (the majority of the lymphatic system is just below the skin). Stretching the skin stimulates the lymphangions to contract more often, improving lymph circulation. Lymphatic drainage is performed in a precise manner to activate lymphatic flow, which, in turn, decreases tissue congestion and stimulates the immune system. Lymph circulation can be increased six to ten times the standard rate as a result of a single session of lymphatic drainage. This technique has been used since the early 1930s and is a standard practice in Europe. Now gaining recognition in the United States, it is regularly prescribed for women following mastectomies to minimize lymphedema and is reimbursed by many insurance companies. Lymphatic drainage is an excellent complement to any surgery, as it reduces swelling (sometimes within minutes of a treatment), decreases healing time (increases circulation and brings more of the necessary healing ingredients to the incision site), and improves proper scar formation. Lymphatic drainage can be performed just 24 hours after surgery. In addition to lymphatic drainage, drinking plenty of water, eating a healthy diet, deep abdominal breathing and exercise are all ways to support lymphatic circulation. Every time we contract a muscle, the muscle rubs against numerous lymph vessels, stimulating them to contract. Yet another reason exercise is so good for us! Edema is swelling due to excess fluid in the affected tissue. Edema is common at the site of physical trauma (e.g. sprained ankle), among pregnant women and people who stand for a large part of their work day. Edema of the feet or legs usually improves once the person sits down and raises their feet. The initial symptoms of lymphedema are similar to regular edema. However, lymphedema is a condition whereby protein-rich fluid collects in tissue. Normally, protein molecules leave arterioles and enter the interstitial spaces (space between the cells). The protein molecules are too large to be re-absorbed by venules and in a healthy lymphatic system, this protein-rich fluid is reabsorbed by lymphatic vessels and circulated through the lymphatic system, filtered by lymph nodes and eventually the lymph fluid returns to the circulatory system. However, a compromised lymphatic system may be unable to reabsorb this fluid. Protein attracts water, so the longer it takes for the lymphatic system to "pump out" this protein rich fluid, the more fluid is attracted to the protein and more swelling occurs. Lymphedema is a disease which, if not treated, has a serious negative impact on health. Left unchecked, the swelling due to lymphedema increases, producing elephantine limbs. Eventually the swollen tissue turns fibrotic, i.e. hardens, further reducing lymphatic functioning. In extreme cases, doctors have suggested amputation of the affected limb. The accepted treatment for lymphedema is Complete Decongestive Therapy which consists of lymphatic drainage, bandaging of the affected limb, exercise and impeccable skin care. A lymphatic drainage session always begins at the neck. There is a high concentration of lymph nodes in the neck and the largest lymphatic vessels are nearby in the chest area. Thus we always start by treating the neck and shoulders – to stimulate the lymph nodes and the right and left lymphatic vessels. After the neck, the session would generally move on to the affected area, most often the limbs with lymphedema. A series of light strokes move in the direction the lymph should flow. Lymphatic drainage always starts closest to the trunk of the body and works out along the limb (proximal to distal), using an "uncorking" process. Uncorking stimulates the lymph vessels closest to the body to begin clearing. As treatment moves away from the body, vessels initially treated are better able to handle more fluid movement from the vessels farther down the limb. When lymphatic drainage is complete, the affected limb is bandaged with short stretch bandages. These bandages differ from the common "Ace" bandage which applies constant pressure. Ace bandages should never be used when treating lymphedema. Short stretch bandages have an active as well as a resting phase, so they do not apply continuous pressure like the Ace bandage. The resting phase is important to healthy circulation. Bandaging is a vital part of treatment. Once the area has been treated with lymphatic drainage, some fluid has been moved out and swelling is somewhat reduced. Bandages apply pressure on the tissue to help prevent further fluid accumulation and to aid in the re-absorption of existing fluid. These bandages are left on at a minimum overnight and ideally until the next visit to the therapist. If possible, clients learn to bandage themselves and can reapply the bandages after a shower or bath. If left un-bandaged, the risk is great that swelling will return to pre-treatment stage. Consistent bandaging alone can help to reduce swelling from lymphedema. Clients must participate in their own therapy by doing some simple movement exercises. Lifting the affected limb, doing easy circles with the arm or leg, bending at the knee or elbow are all simple but effective "exercises" for stimulating lymph flow. Deep diaphragmatic breathing is also important. In addition, clients must take special care with their skin. The skin of lymphedema clients can be very sensitive and prone to infection and wounds. Great care must be used to protect the skin. Important skin care includes a hypoallergenic moisturizer. In severe cases, such as those left untreated for an extended period, lymphedema clients must see a lymphatic therapist five days a week for lymphatic drainage and bandaging. In Europe, clients are seen twice a day. With continued care and good client compliance, lymphedema can be effectively treated and reduced.